It was sort of late again as we uploaded the report last night. 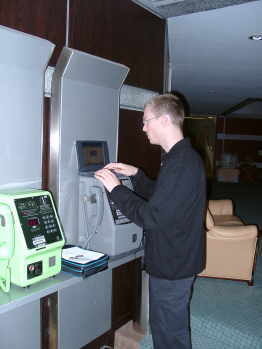 Here you see Marco at 1.15 h a.m. at 43% of the upload in the dark hotel reception area. At 56% the internet connection was interupted once again - but we didn't give up. It took another 12 minutes and the uploading was complete. Just a few seconds later the phone spitted out our last empty phone card - lucky us! 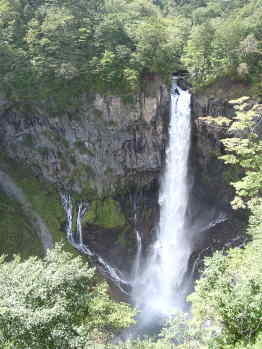 The other major attraction next to many impressive temples and shrines in Nikko is the Nikko National Park. We rode the bus to Kegon-waterfalls and were impressed by the waterfall that crashes violently down to the rocks 100 meters below. Unfortunately the observation of this spectacular display of nature was often interrupted by bus loads of senior citizens. They were determined to look at the fall whatever the method they had to use to get to the best place at the observation deck. This was rather inpolite. 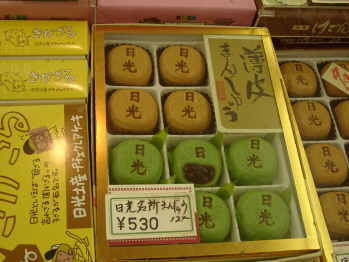 Main objects of these silver-headed tourists` craving were the sweets, almost all of them filled with sweet bean paste. Regardless of how they look like (some look like waffles, some like cookies or even eggs) they always contain the sweet filling. We have probably seen close to 50 variations, some in luxurious confectionaries, some sold at supermarkets by the pound. No matter what shape they come in, they won`t make it on to our favorite list. 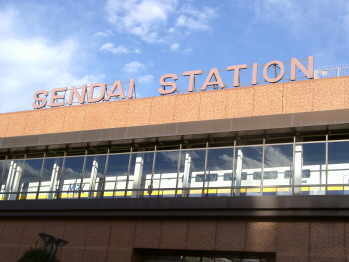 In the afternoon we arrived in Sendai after a two hour ride on the Shinkansen. We chose this metropolitan city of Northern Japan as the step stone before we go on to Matsushima tomorrow. 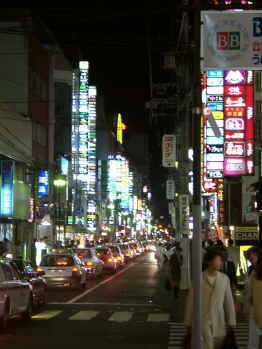 Besides we wanted to prepare ourselves for the Mega-Metropolitan Tokyo after travelling through lightly populated mountain cities. Here you don`t see the start line-up of the Sendai taxi-race but actually the normal crowdedness of the taxi-stand in front of the main station. 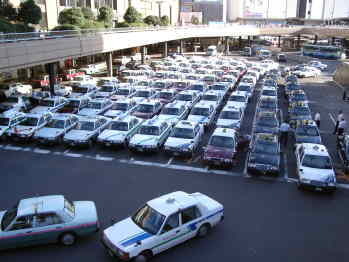 Riding taxis does not come cheap in Japan. 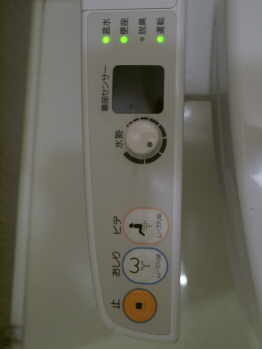 The meter starts at 650 Yen (~ 7 US-$) but they offer quite some service: driver in chauffeur uniform with white gloves, friendly bowing, white hand-knitted seat covers and a left passenger door that opens and closes automatically. 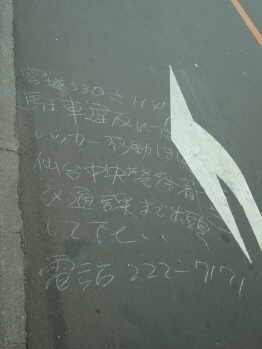 We came across this writing on the asphalt on the way to our hotel. What kind of message is that ??? It turned out to be an information from the Sendai police station for a car owner whose car was towed for a parking violation. They informed the owner on the time of towing and the phone no. under which the car owner gets the information how much he / she has to pay and where to get the car back. In Germany we always have to assume the car had been stolen. As we stay overnight in a big city we wanted to mingle with the young folks. What is IN for young people here? We observed and researched and made ourselves familiar with a new kind of restaurant. 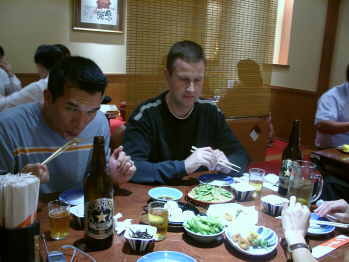 Sushi is OK but if you go out with friends then go out to an `Izakaya`. It`s a mixture of bar and restaurant. You order lots of drinks and throughout the course of the evening small portions of different kinds of food. (Sort of like Japanese Tapas). An informal way of going out at night - and not too expensive. We really enjoyed this restaurant and ordered deep fried fish (top right side on the photo - you can even eat the bones), salad with glass noodles, beef tongue with green onions, Sashimi, sweet potatoes, Yakitori (grilled chicken on a skewer), Tofu and a lot more. All just in small quantities and perfect for tasting many kinds of food with many friends. 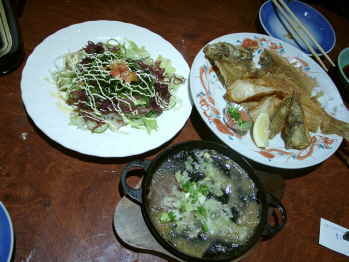 In general it is very common here to order lots of different dishes and share. The neighbour to our left had enjoyed enough (or even more) Sake. The conversation grew louder and louder and some topics were discuss over and over again. 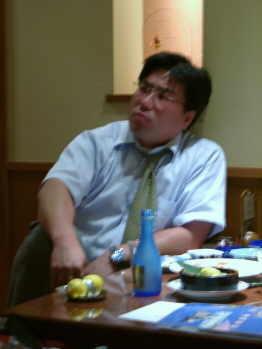 Many employees go out with their colleagues after work to these restaurants. Therefore it is not uncommon to find many white collar workers with ties. It usually doesn`t take long though until the tie is loosened - this makes it a lot easier to discuss the latest gossip from work. 6) What is the object on the photo ?